Two comics from September 17, 2014. Plus Second Opinions, featuring questions answered by a different listener each week, with Matt Baum. 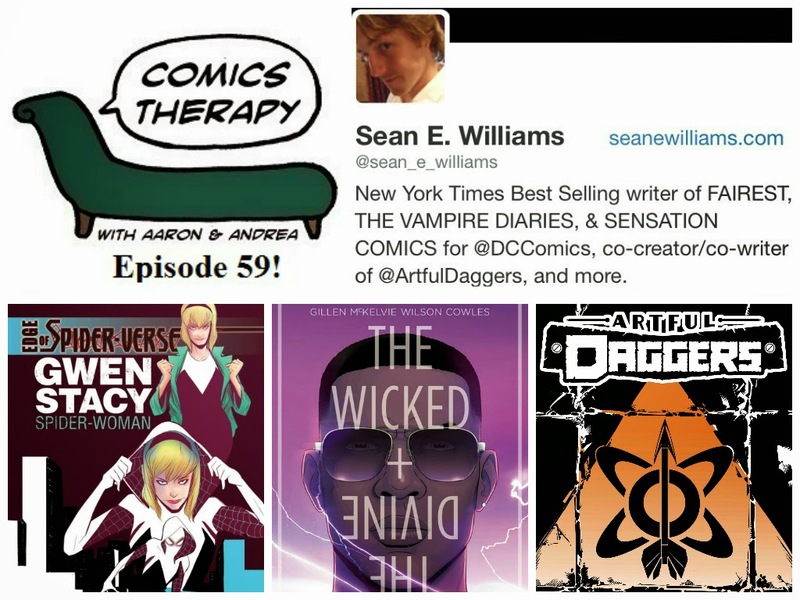 On The Couch: writer Sean E. Williams. The theme this week? If music be the food of love, play on. For centuries, music has been a focus and an outlet for friends, fools and foes alike. It’s a shared passion that brings us together like few other things can. It’s a distraction from pain and an opportunity for greatness. Every musician dreams of hitting it big, becoming a star, becoming a god. We’re looking at two books this week where music and character intertwine. And where gods and mortals do, too. Aaaaand then we recorded. And Aaron essentially vetoed the theme, as he is wont to do. So instead of talking about comics and music, we mostly just talk about how much he hates comics, and other fun things that are fun. Sean is the co-writer of Artful Daggers, published digitally by Monkeybrain Comics and in trade by IDW. He wrote the New York Times best-selling Fairest: Return of the Maharaja, published by Vertigo, and has written for The Vampire Diaries and upcoming Sensation Comics, published by DC.